The world's worst video game is back for two weeks of torture in the desert. This week kicks off the 10th edition of one of video gaming's great original charity marathons — Desert Bus for Hope. All of the drama of piloting a 1990s-era motorcoach with bad alignment is viewable here, for free, but it would be kind if you left a donation. Desert Bus for Hope is the the philanthropy of Loading Ready Run, the comedy troupe from British Columbia who got the idea to torment themselves for a good cause back in 2007. 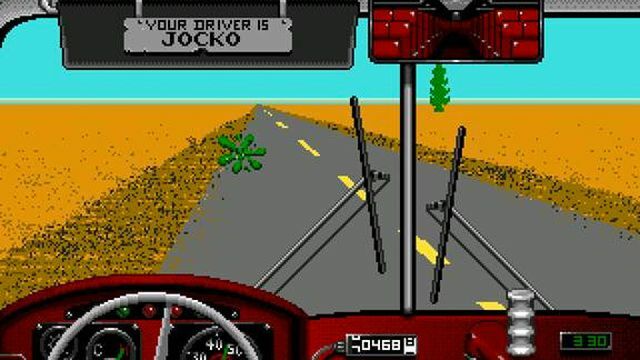 The marathon employs Desert Bus, the famed minigame satire from Penn & Teller's Smoke & Mirrors for Sega CD. The game is intentionally painful. Players must drive a bus between Tucson, Ariz. and Las Vegas at 45 miles per hour, in real time. Each completed trip awards one (1) point. The charity drivers commit to drive a certain time, which lengthens as more money is donated. So you may visit this site to make a contribution, which notes how much money is needed to keep them going for another hour of pain on the 16-bit road. Every year of Desert Bus for Hope has raised more money than the one preceding it; the beneficiary is Child's Play, the Penny Arcade charity that donates toys and video games to hospitals (particularly children's hospitals) nationwide, to comfort children in their long-term care. Last year, Desert Bus for Hope raised a record $683,720. More than $3.1 million has been raised by Desert Bus drivers since 2007. Already $23,800 has been raised and the team is committed to drive for 109 hours. It costs $567.92 to make them drive one more. So, give until they hurt.